Preacher is an American drama television series developed for AMC starring Dominic Cooper. It is an adaptation of the comic book series created by Garth Ennis and Steve Dillon, and published by DC Comics‘ Vertigo imprint. The font used for the title of the TV show is probably Impact by Geoffrey Lee. For the font setting the text “The Beginning Is Nigh”, it is ITC Conduit Bold by Mark van Bronkhorst. 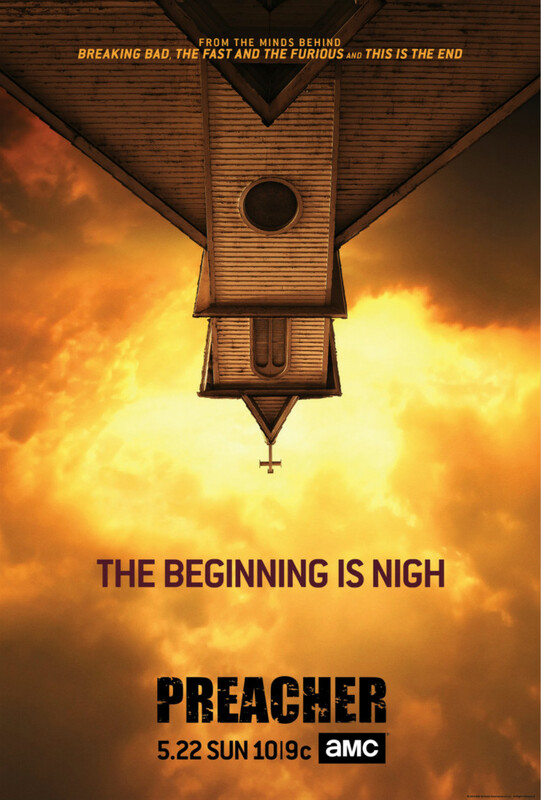 In addition to Preacher (TV Show), Impact typeface is also used in the following logos, movie posters or album covers etc., including: Soul Eater, Parental Advisory Label, Hot Wheels AcceleRacers, Chicken Run, Advanced Warfare, Nike, Alan Wake, Yellow, The Aggression Scale, No Country for Old Man, Five Finger Death Punch, Criminal Minds, Marvel: Ultimate Alliance, Call of Duty, Total Blackout.